Finding Great Books for Your Kids! Do you ever get lost in the library or the bookstore? In all honesty, it isn’t really a bad thing when that happens, but with our busy lives, sometimes we find something quick and easy. That is why whenever I need a new children’s book, I turn to the experts and look at the award winners. Here are few of the great children’s book awards and the winners for 2016. By far my favorite book award is the Cadecott Award. The Caldecott Medal was named in honor of nineteenth-century English illustrator Randolph Caldecott. It is awarded annually by the Association for Library Service to Children, a division of the American Library Association, to the artist of the most distinguished American picture book for children. The illustrations are always so captivating. Great for engaging readers of all ages! Before Winnie-the-Pooh, there was a real bear named Winnie. Here is the remarkable true story of the bear who inspired Winnie-the-Pooh. Hailing from the Tremé neighborhood in New Orleans, Troy “Trombone Shorty” Andrews got his nickname by wielding a trombone twice as long as he was high. Trombone Shorty is a celebration of the rich cultural history of New Orleans and the power of music. An owl, a puppy, a bear, a rabbit, and a pig—all toys arranged on a child’s windowsill—wait for marvelous things to happen in this irresistible picture book. Stirring poems and stunning collage illustrations celebrate Fannie Lou Hamer, a champion Civil Rights. Every Sunday after church, CJ and his grandma ride the bus across town. This energetic ride through a bustling city highlights the wonderful perspective only grandparent and grandchild can share. Author AlicePosted on February 25 February 25 Leave a comment on Finding Great Books for Your Kids! You and your students are bound to love Readers’ Theater! Readers’ Theater (also spelled “Reader’s Theatre” or “Readers Theater”) is an activity in which students, while reading directly from scripts, are able to tell a story in a most entertaining form, without props, costumes, or sets. This is a reading activity, and students are not asked to memorize their lines. They are, however, encouraged to “ham it up” and use intonation and gestures appropriate to their characters and their characters’ words. · It provides repeated reading practice—an important factor in building fluency. Repeated reading practice also improves students’ confidence in, and enthusiasm for reading. It’s an enjoyable change of pace from everyday practice sessions. My students love it! And so do we. Students are so thrilled at their newfound skill that they ask to perform for younger classes. · It’s a wonderful opportunity for children who are used to feelings of failure to provide expertise entertainment for others. · Readers’ Theater scripts cover many different subjects across the curriculum making them versatile. Don’t be intimidated by the performance aspect. It’s all the excitement of a play without the pressure and responsibility. The students have fun, you have fun, the audience (if you choose to perform for one) will have a great time, and everyone learns! Not sure when to introduce your students to chapter books? From the child’s point of view it can seem a bit daunting to read independently, but listening to a chapter book is beneficial, too! 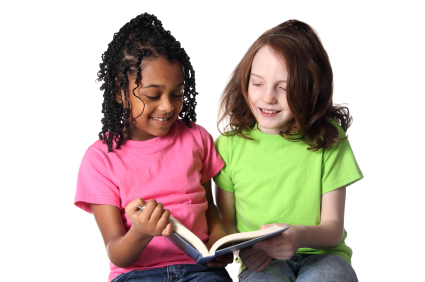 Children comprehend books that are a few levels above their own reading level when the stories are read aloud. Your expression and manner will help children figure out words that are new to them. When children hear James and the Giant Peach read to them, they love imagining the horrendous escaped rhino and the mischievous Weather Men that lived in the clouds. They don’t have to worry about stumbling over words they don’t know. They can snuggle up every night and listen to James’ adventure while their imaginations paint the pictures for them. This encourages children to try more books, because they know that they can understand new words from their context — even words they’ve never seen in print. Have a child choose a page in the middle of the book with a lot of text, and make a fist. Explain to the child that she should not use the fist to punch anyone in the nose. Instead, read the page silently, and if you come to a word you don’t know and can’t guess, put up your thumb. If you find another word, put up another finger, and so on. If you reach the end of the page and between three and five are up, that means the book will be a challenge. The child can decide if she is motivated enough to try to read it anyway (you can offer help), or she can choose to save it for the future. A pleasure read should have 0-2 fingers up. This technique is great because it provides a quantifiable method for the child to apply. Nothing is more disheartening than getting excited to read a certain book, borrowing it from the library and taking it home, only to find out it’s too difficult to read independently at that time. Esmé Codell’s suggestion allows children to gauge on their own what books will be appropriate for them. If you’re looking for a chapter book to read to a group, imagine the youngest age the author intended the book for. If the story is captivating, your more advanced readers will enjoy the book nonetheless. 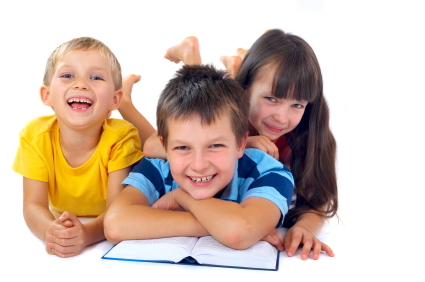 Reading Aloud, Recommended Chapter Books, and Motivating Your Child to Read for more information. Codell, Esmé Raji. How to Get Your Child to Love Reading. Chapel Hill, NC: Algonquin, 2003. To the Original Wizard of Oz, Happy Birthday! L. Frank Baum is a household name thanks to his relentless perseverance. The Wonderful Wizard of Oz is a culmination of a career’s worth of work. It was published in 1900 after many minor publications and musicals. We all recognize the famous ruby slippers that Dorothy wears on her journey down the yellow brick road, but did you know they’re silver shoes in the book? Red looks better on screen so a minor tweak in the movie turned into one of the most recognizable icons of the story. Little facts like this make reading the book and seeing the movie a great activity for family reading. Use the differences as conversation starters and have children voice their opinions about various changes to the plot or characteristics of the story. What would they do differently if they were directing the movie? What parts of the book were left out or changed and why? Do the changes affect the message of the story? Oz has captivated imaginations for over a hundred years and still continues to do so. In the time of women’s suffrage, Baum married Maude Gage, who was an active feminist. Her influence on his writing is apparent with strong female leads and comical situations such as the revolution in The Marvelous Land of Oz. He even dedicated The Wizard of Oz to her. “As they passed the rows of houses they saw through the open doors that men were sweeping and dusting and washing dishes, while the women sat around in groups, gossiping and laughing. What has happened?’ the Scarecrow asked a sad-looking man with a bushy beard, who wore an apron and was wheeling a baby carriage along the sidewalk. Baum was an innovator of children’s literature in many ways. Embracing the qualities of Anderson and Grimm’s fairytales, he put his own spin on what a fairy tale should be. The inhabitants of Oz are complex and detailed which makes them relatable. Baum refrained from using extreme violence and love interests since he believed children “wouldn’t find that sort of thing interesting.” Oz and all of its stories became one of the most beloved tales of all time because he wasn’t afraid to keep trying. Imagine if he gave up because his first 15 years of writing didn’t lead to any major success stories. Baum not only wrote a classic fairy tale, he lived one. Celebrate L. Frank Baum’s birthday May 15th by reading one of the 15 Oz books. Take an imaginary journey but remember, there’s no place like home. Texting and internet memes must surely be the downfall of formal language, right? Quite a few scholarly studies point to no, actually. While it’s true that conventional English spelling and correct grammar are noticeably absent from the majority of texting conversations, the phonetics are accurate. As literacy advocates, seeing the phrase “C U l8r 2nite” is the equivalent of hearing nails on a chalk board, however one must first understand the correct way to write the phrase before it can be broken down to the text version. Texting also provides an “additional resource for learning about and experimenting with letter-sound correspondences and language, and for reading and ‘decoding’ text.” (Vosloo 2009) The same study also stated, “If our children are showing difficulties with reading and spelling attainment, it would seem that this is in spite of the contribution of textism use, not because of it.” When put into this context, it makes it easier to see that language is evolving not necessarily degrading. While texting and the language should most definitely not be allowed in the classroom, it is a fact of life in this day and age. What it comes down to ultimately is that texting and internet lingo has a time and a place, much like clothes. Texting isn’t wrong but you wouldn’t wear old sneakers to a formal event, would you? Vosloo, Steve. “The effects of texting on literacy: Modern scourge or opportunity?” Shuttleworth Foundation Issue Paper April 2009. Web. Retrieved April 27, 2010.